QUALITY ASSURANCE, LONG-LASTING MATERIAL: Tightly woven creating a high density, 100% Cotton fabric which last long and can hold up to your washings - Purchase confidently. 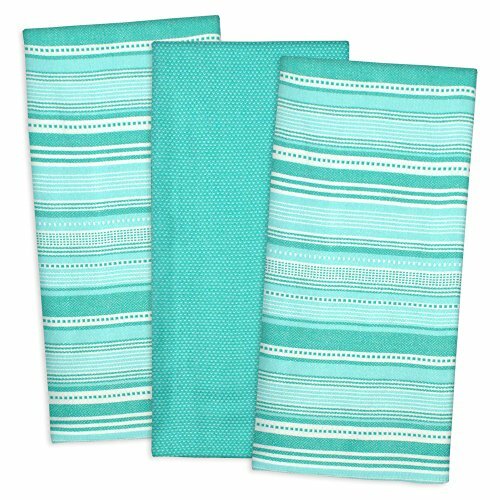 ULTRA ABSORBENT AND LOW LINT: These towels are lightweight, super absorbent and dry quickly with the corner loop; Machine washable and durable for daily use -Get the job done quickly the RIGHT way with our Dish Towels! GREAT GIFT CHOICE: Sophisticating Urban Stripe design with multiple color choices to match with your kitchen décor; Perfect for Mother's day, holidays, housewarming and hostess gifts.